We went a little overboard with experimental beans this year, and now we're starting to get an idea of which ones like our garden. First of all, I should note that our old standby Masai Beans are still plugging right along. We already have a gallon of delicious green beans in the freezer, with many more to come as my later-planted beds start to bear. Masai Beans are really the best green beans I've ever tasted, and they're stringless, so preparation is a breeze. Plus, you can save the seeds --- we haven't bought green bean seeds in three years. On the experimental side, a friend of mine mailed me a few of her favorite dried beans to play with --- Yellow Indian (pictured above), Allubia Criolla, and Cayamento Cranberry. My goal here is to find a dried bean that will capture even Mark's interest, and I'm willing to try as many varieties as it takes to reach that point. 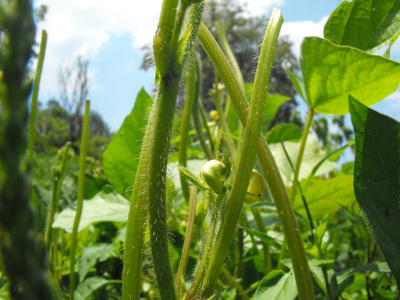 Currently, the pole beans are happily running up their trellis, blooming like crazy, and setting big pods. I won't really have information for you, though, until we run a taste test. Our garbanzo beans are less happy. 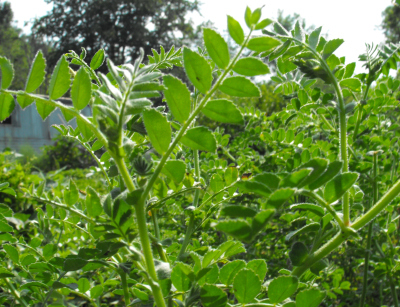 I planted Black Karbouli Bush Garbanzo at the end of April, but later learned that garbanzos like cool weather and should be planted at the same time as the peas. No wonder a third of my plants dried up and the rest have luxuriant foliage but no signs of blooms. Even if we get nothing out of this experimental bed, I'll try the garbanzos again next spring, planting in a more proper time frame to see what develops. We also planted Urd Beans (for sprouting) and some Endamame Soybeans (for endamame). The two types of beans seemed happy as little clams...until the deer came in and ate them. 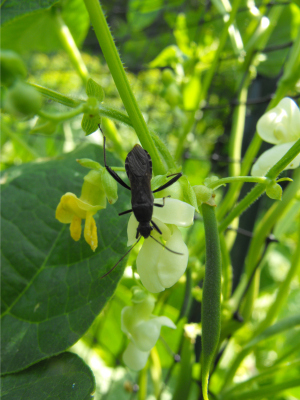 We had a few minor deer incursions this summer when deterrents went down, and our four-legged f(r)iends seem quite partial to my experimental crops. So, just like with our garbanzos, if we fail to get a crop this year, I won't despair. Now that we've done everything wrong that we possibly can with beans, I'm hoping next year will be a stunning success. For the sake of comparison, oilseed sunflowers were one of our big experiments last year, so the deer ate them down to the ground. This year, the sunflowers were no longer experimental, so the deer left them alone and the plants are now towering over my head. Clearly, there is a moral here, if I can only figure it out. Maybe the deer are bored by my experiments posts? Our homemade chicken waterer is a great way to keep your chickens cool and hydrated during a heat wave. Have you figured out how the deer are getting on the internet and reading your blog in the first place? If you could keep them from learning which plantings are experimental, that could help your problem! At any rate, please don't quit posting about your experiments just to head off the deer - your experiments give me plenty of ideas for for experiments of my own in our garden! I'm glad you enjoy our experiments posts, even when they consist of repetitions of "Nope, that didn't work." An on/off topic question. Have you thought of planting some or much of what the deer like well away from your "garden" area? Maybe you can lure them to another part of your property and fatten them up for hunting season. Just don't put a salt lick out as many places this is illegal to hunt around a salt lick, but randomly planted deer food should be a good idea I think. I've vaguely considered this, but it seems like it would be a lot of work to make my deer plot more tasty than my human plot. After all, we weed and water and carefully plant delectable foods. I can never quite wrap my mind around weeding and watering and carefully planting even more delectable foods for the deer, although some people do it --- mostly with heavy machinery, though, plowing and then scattering large amounts of grain.